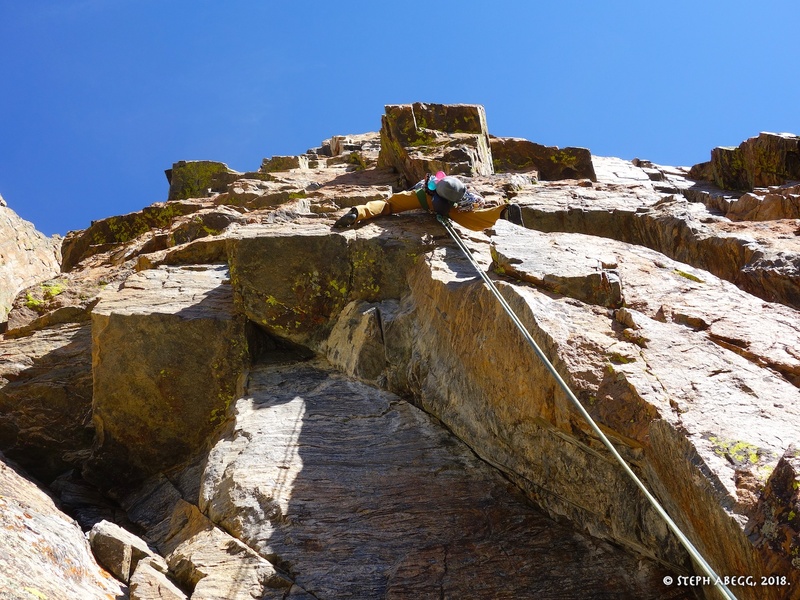 Excellent climbing on excellent rock with excellent position. 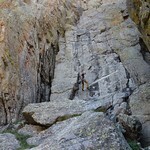 The Saber is the long narrow buttress to the right of The Petit Grepon. 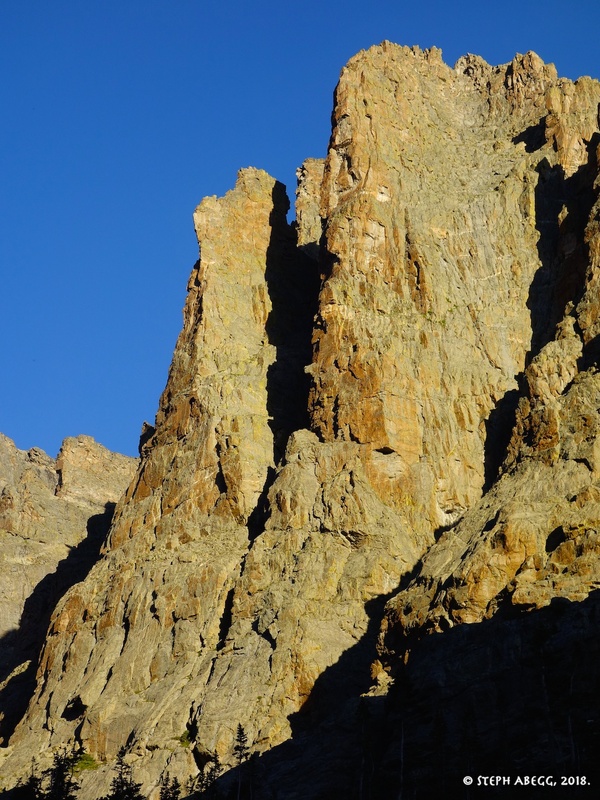 One of the best routes on The Saber is the Southwest Corner, which ascends the obvious sharp arete/corner at the junction of the west and south faces. 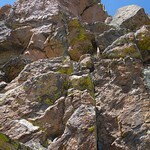 I climbed the Southwest Corner with Dow Williams. 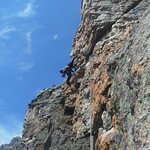 The climbing was excellent and challenging and the exposed position was memorable. 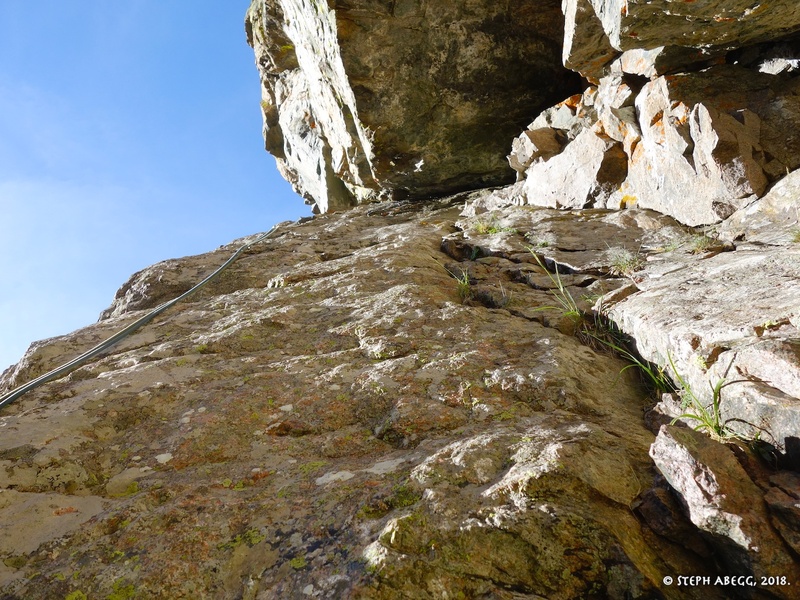 Plus, the route was sunny and featured perfect belay platforms at every belay, making it a very comfortable route to climb. 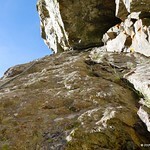 I think the climbing and position of this route is every bit as good as the popular South Face of the Petit Grepon next door (which I climbed in 2007), but whereas the Petit Grepon might have climbers crawling all over it, the Saber will be devoid of people (the day we climbed the Southwest Corner, there was one other party on The Saber climbing the Kor Route, and about a dozen parties on The Petit Grepon, on a Thursday!). 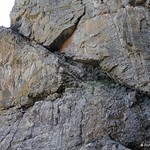 Of course, one big reason for this is that the Southwest Corner is a harder route. 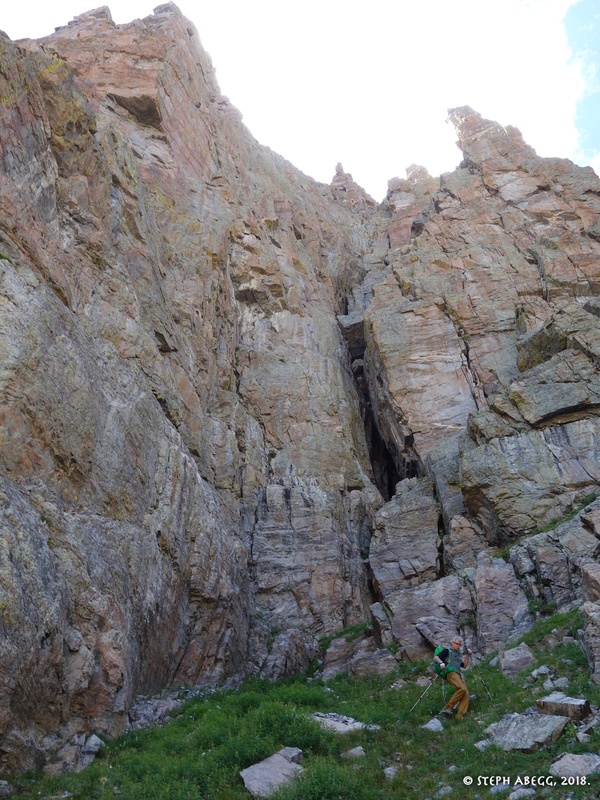 It is defintely no gimmie — the crux Pitch 1 has a fair bit of technical 5.10 moves with tricky gear, and the route above has a fair bit of 5.9. 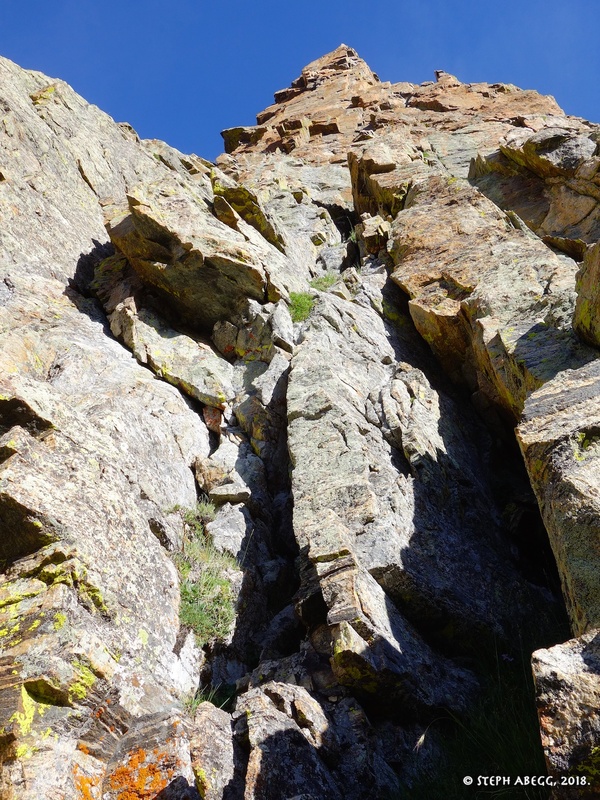 But throughout, the climbing is excellent. 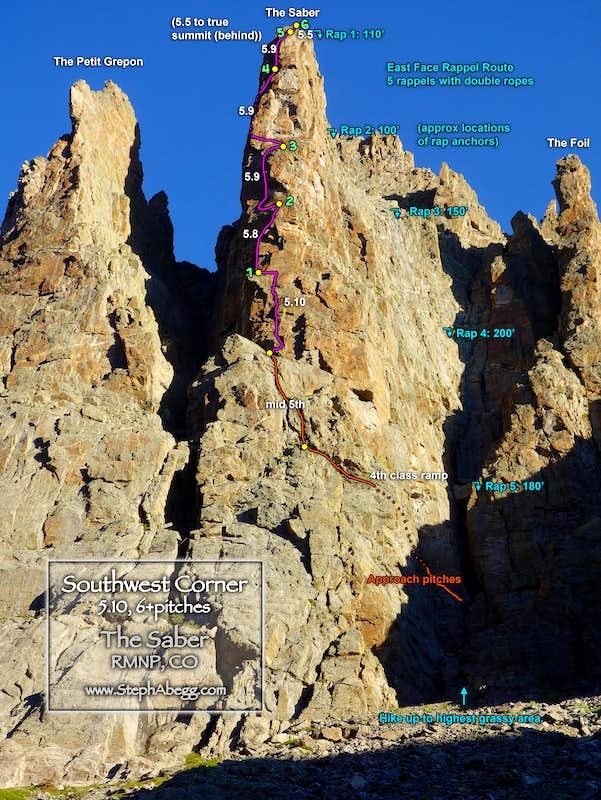 This page gives a route overlay and photos from our climb of the Southwest Corner of Saber. 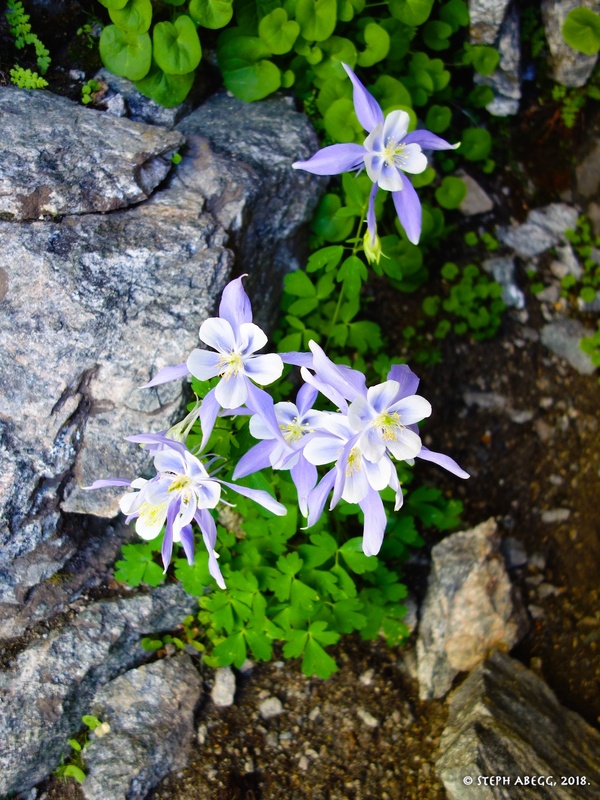 From Glacier Gorge Trailhead, hike the Loch Vale Trail to Sky Pond, then hike up talus to bottom of south buttress. 1. 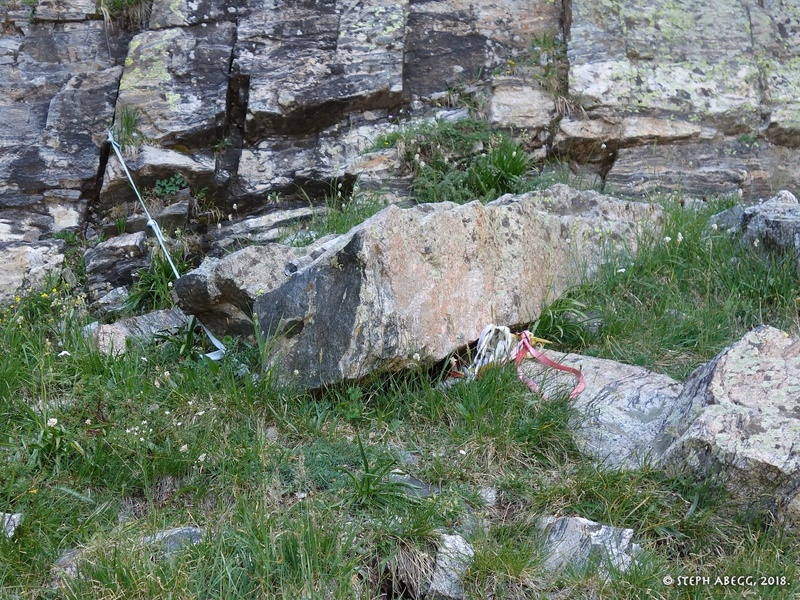 The Petit Grepon and The Saber seen from the approach. 2. 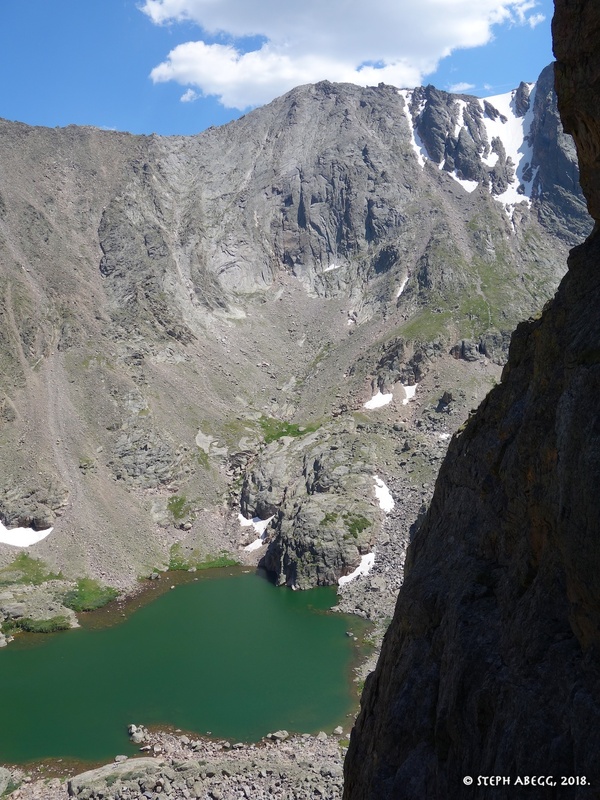 The approach pitches start from the very top of this gully (photo taken after the climb). 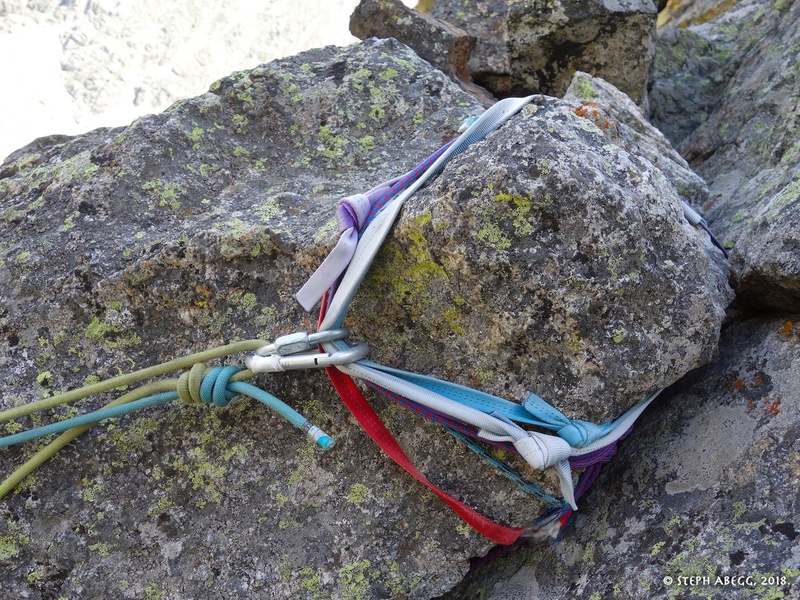 The rap route comes down here too, so you can leave your approach shoes at the base of the route! 3. 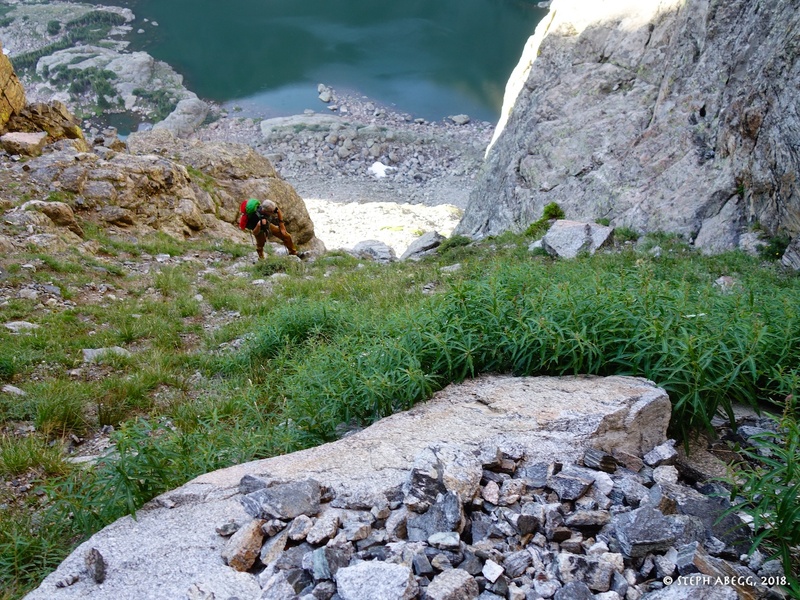 Dow hiking up the grassy approach gully. 4th to mid 5th. 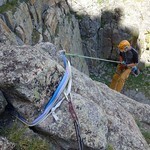 From the grassy area at the very top of the gully, climb up and left along a ramp, belay at end of ramp. 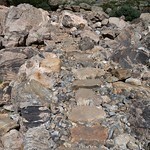 Then climb straight up to base of route. We did this in 2 pitches. 5. The approach ramp is the diagonal ramp cut off by the top of the photo. 6. 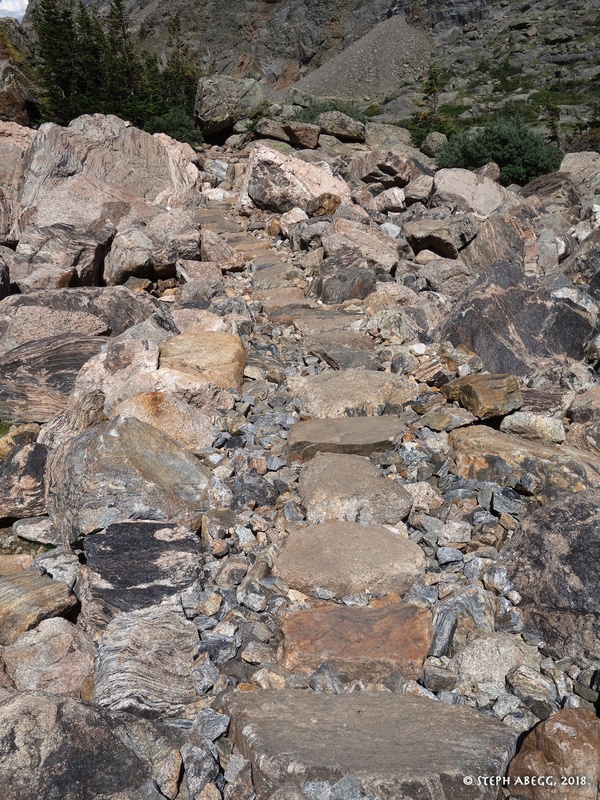 The approach ramp (taken after the climb). 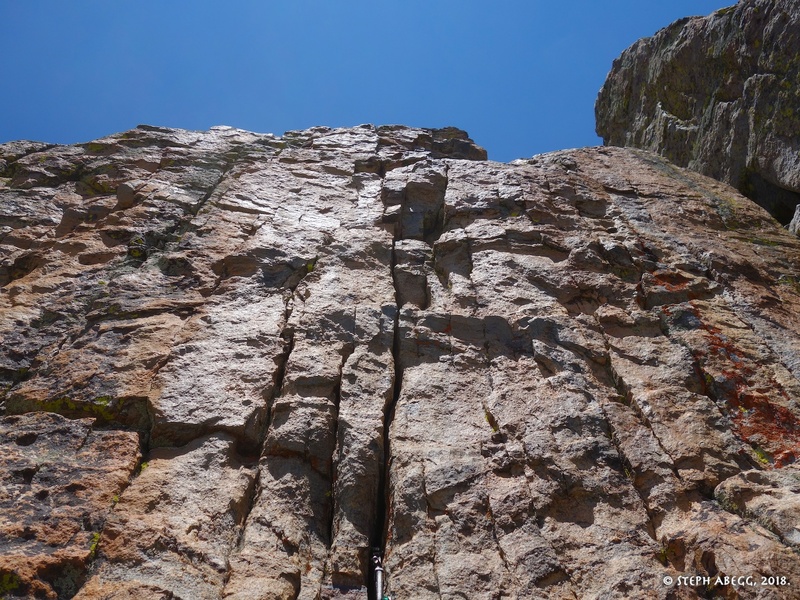 This is easy 4th and gets you to the main south face. 8. 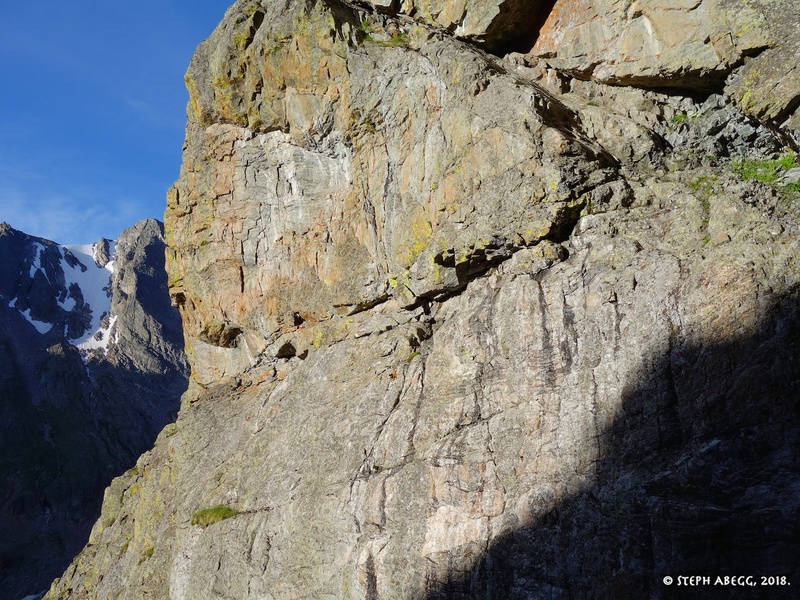 From the end of the approach ramp, we had one pitch of mid-5th climbing to the base of the route. 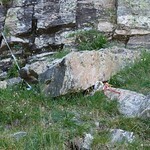 5.10a. 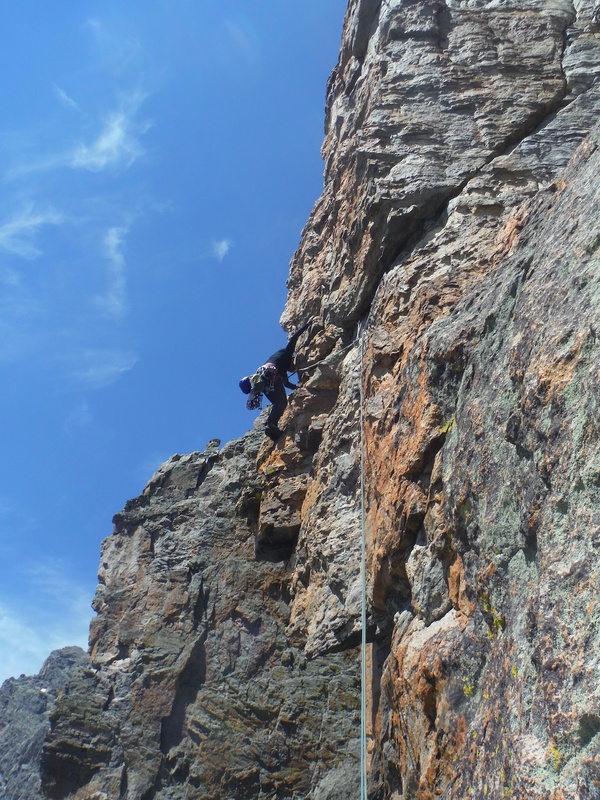 Climb a small left-facing corner to a roof, then veer left and continue up the corner for about 80 feet. 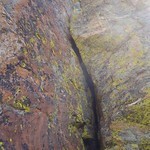 Traverse left to a good ledge at the west end of the face. 10. The corner on Pitch 1. 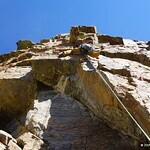 Awesome climbing, especially for the follower. 5.8. Climb a left-facing dihedral system past the left side of a blocky roof, and continue to a ledge atop a pillar. 11. 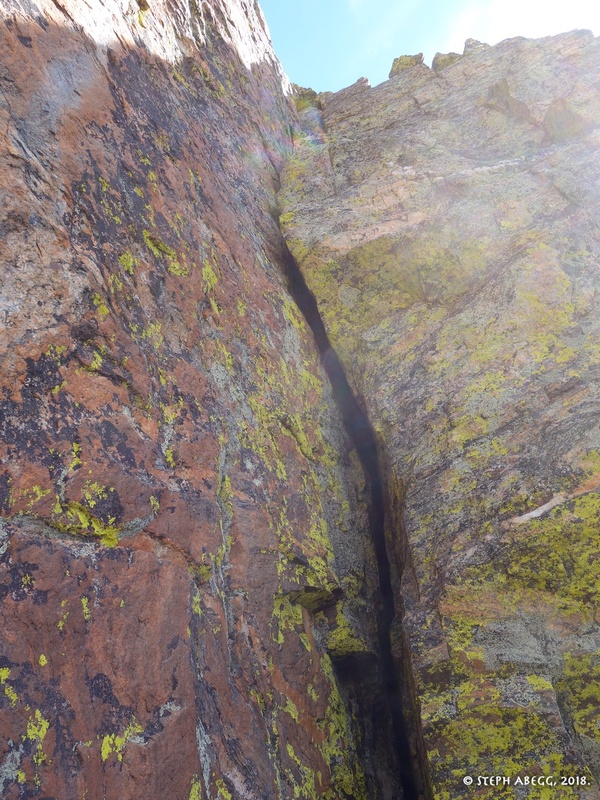 The 5.8 corner on Pitch 2. Pure fun. 12. The pitch ends with a wider corner crack. I was glad to have a #4 here. 5.9. 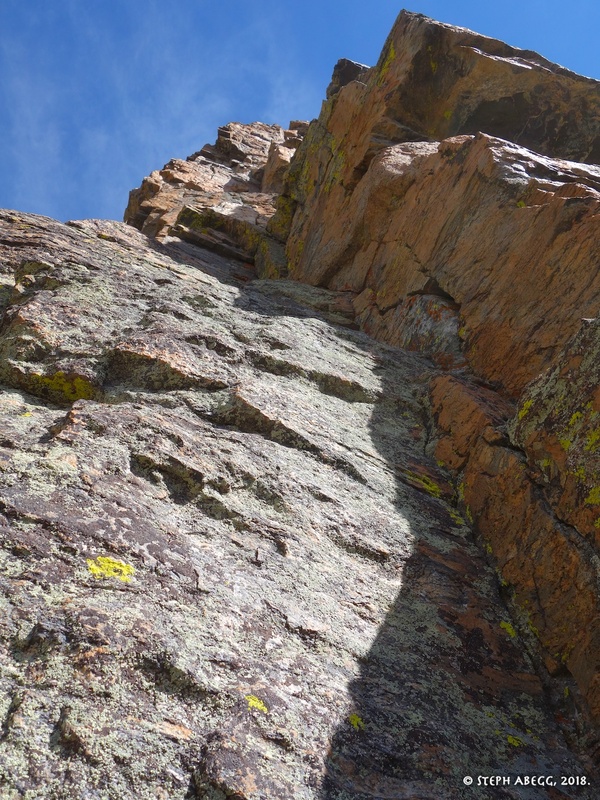 Traverse straight left (5.8), then follow thin cracks to the left end of the roof (5.9). 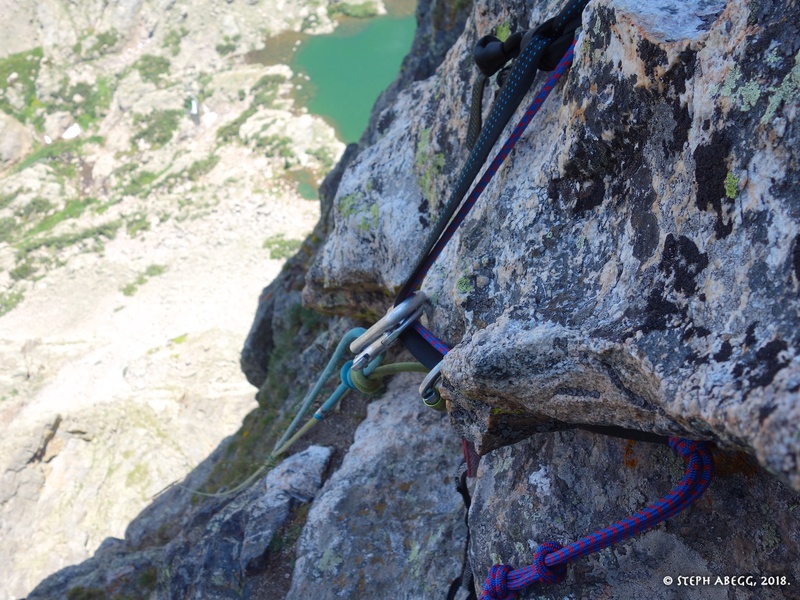 Climb a left-facing dihedral along the left side of a hanging pillar and belay on a good ledge at its top. 13. 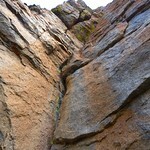 Looking up from the belay. 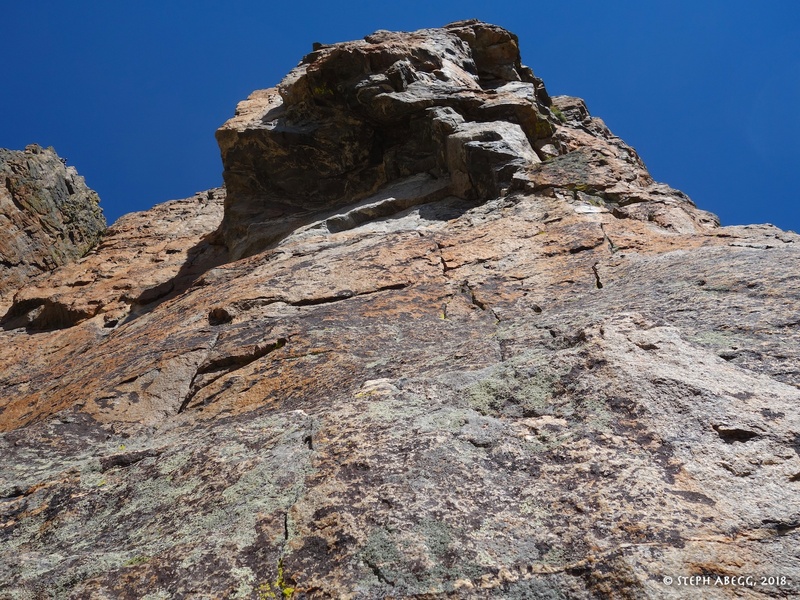 Instead of going straight up, you want to go straight left, then up some thin cracks to left of the roof, from where you follow a left-facing corner system. 14. The thin cracks on the face. 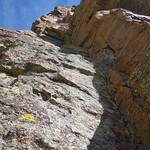 Gear is a bit tricky here, but the climbing is no harder than 5.9. 14.5. 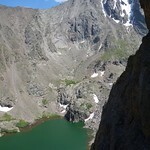 This is what the SW Buttress looks like from the Petit Grepon. Dow here is leading Pitch 3. 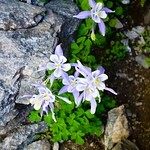 Photo by Wally! 5.9. 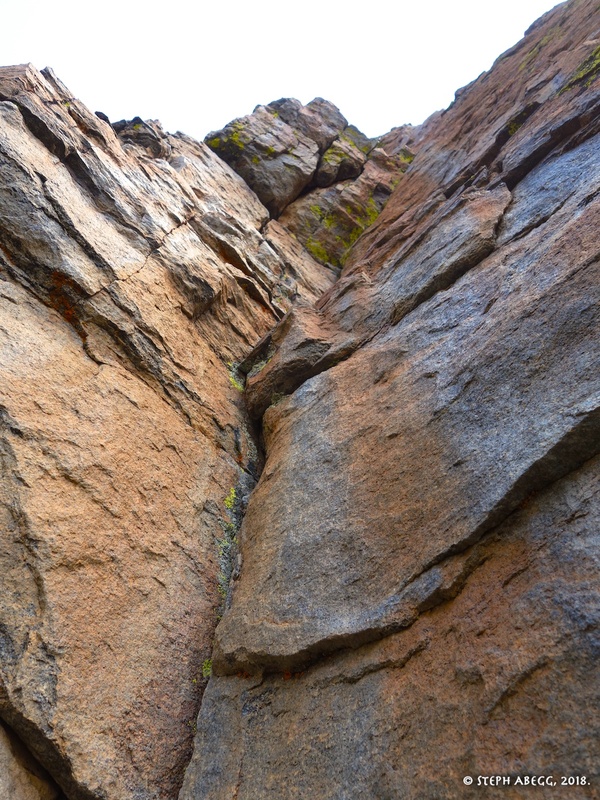 Step down and follow a narrow ledge to the left edge of the face (5.7). 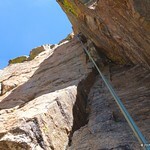 Climb the left of two conspicuous dihedrals, to a good belay on the right. 15. 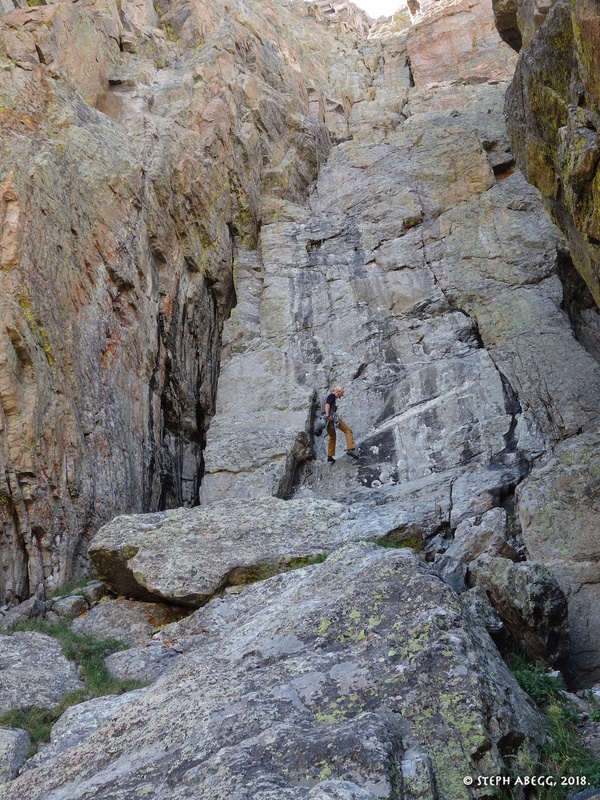 Awesome exposure at the start of Pitch 4. 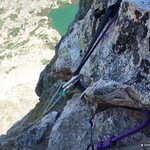 You go around the arete and climb on the left side for the pitch. 16. 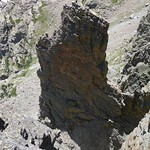 Choose a dihedral (guidebook says second one but the first one looked climbable too) and climb upwards. 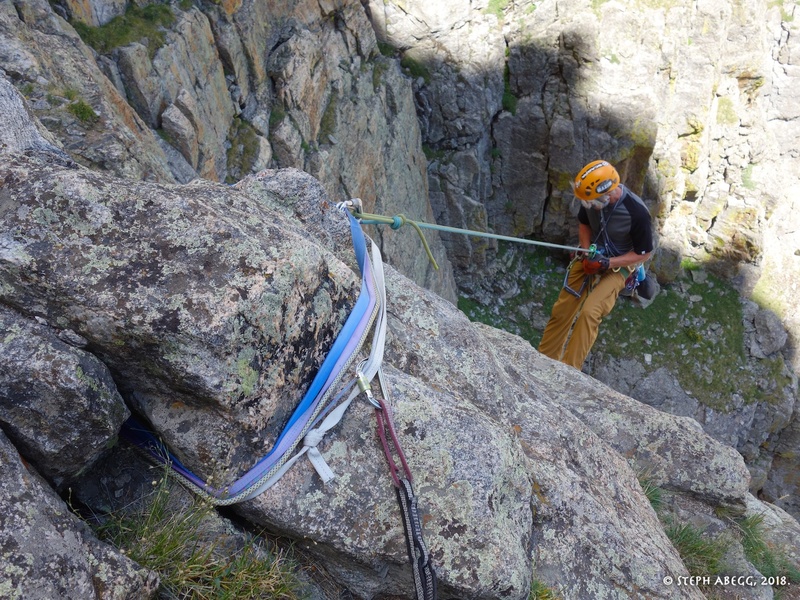 Be wise with using long slings and minimal gear, since rope drag is a possible problem on this pitch. 5.9. 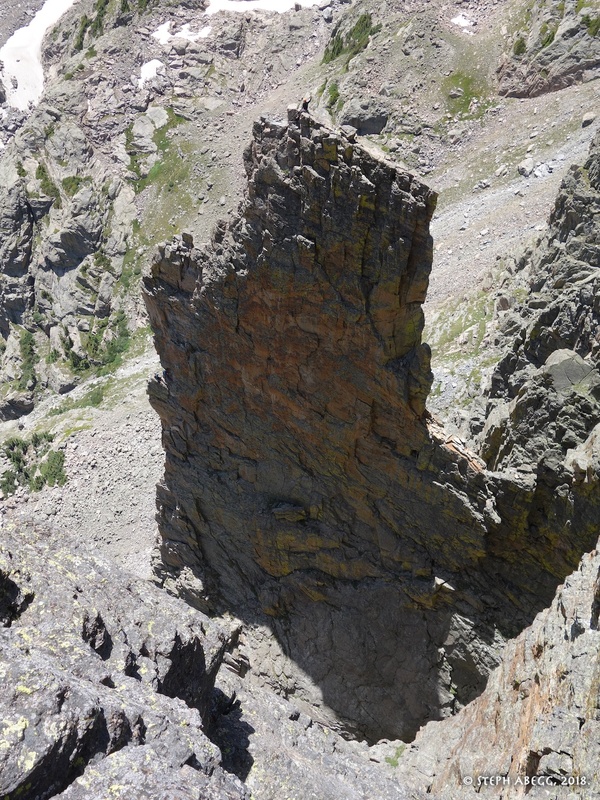 Climb up and a bit right and join with the upper stretch of the right dihedral. 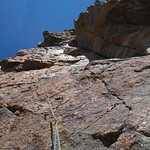 belay on the crest of the ridge. 17. 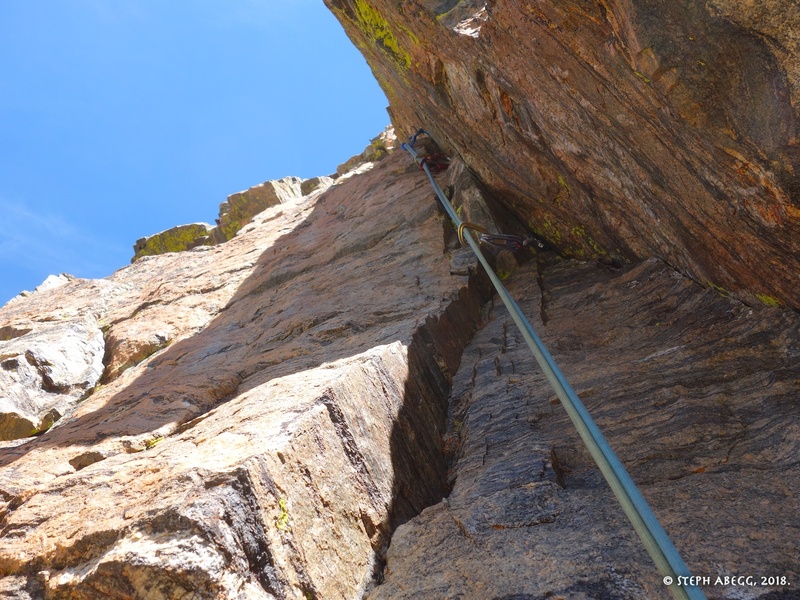 Looking up from above the belay at the top of Pitch 4. 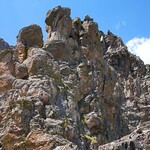 We climbed the crack in the center of the photo, although you could probably also climb the juggy face to the left or the wide corner with chockstones to the right. 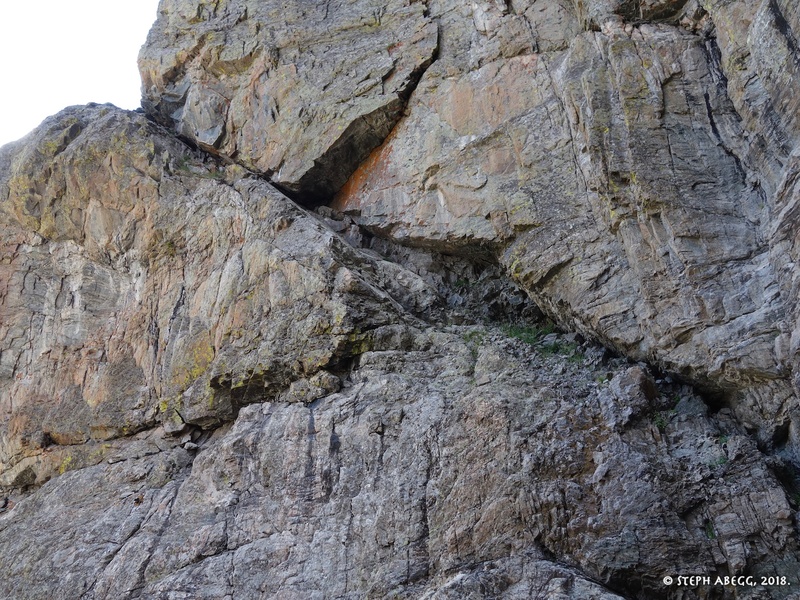 Going straight up seemed a bit harder than 5.9, so I suspect one of the other options is the actual route. 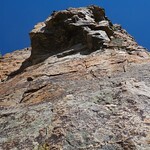 That said, going straight up was good climbing! 5.5. 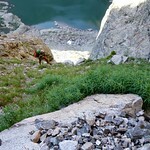 Scramble up the ridge crest to a little summit above a notch. 18. Easy blocky climbing to the top. 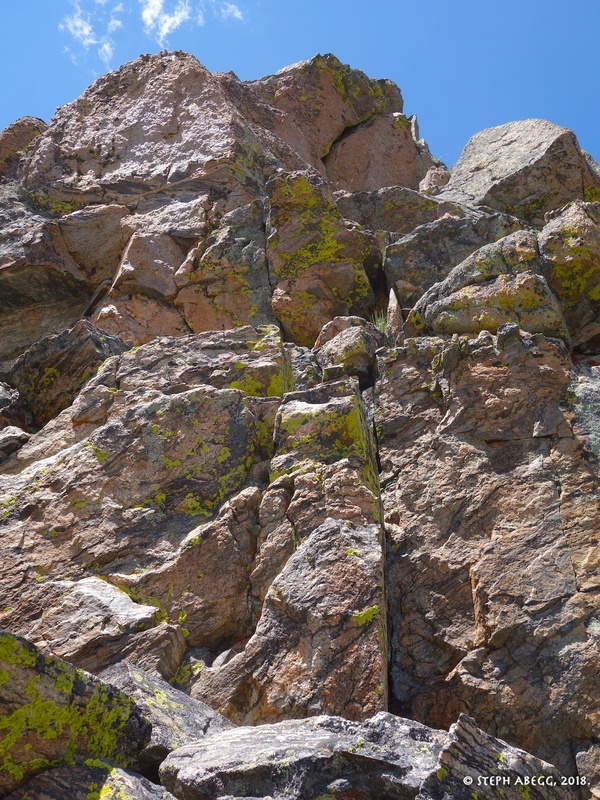 The route ends on a little summit above a notch. 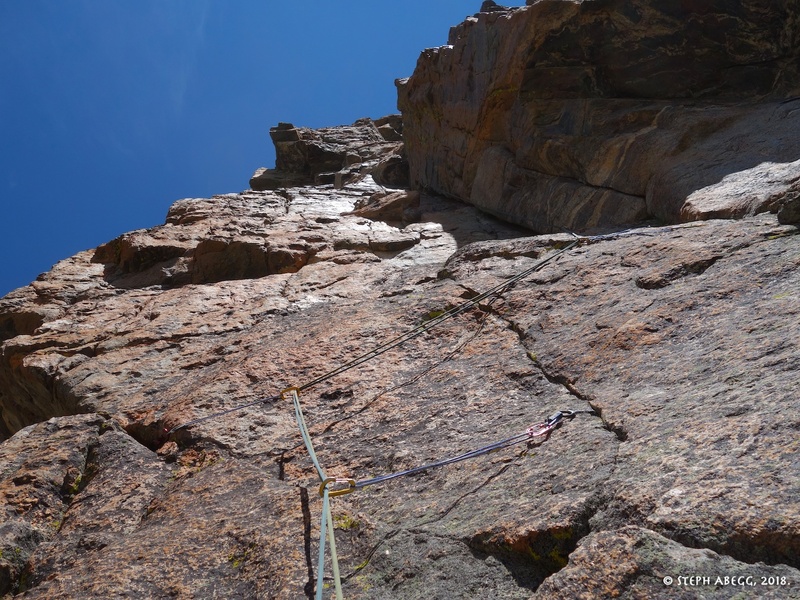 The true summit requires a downlclimb and a bit of 5.5 to get there. 19. 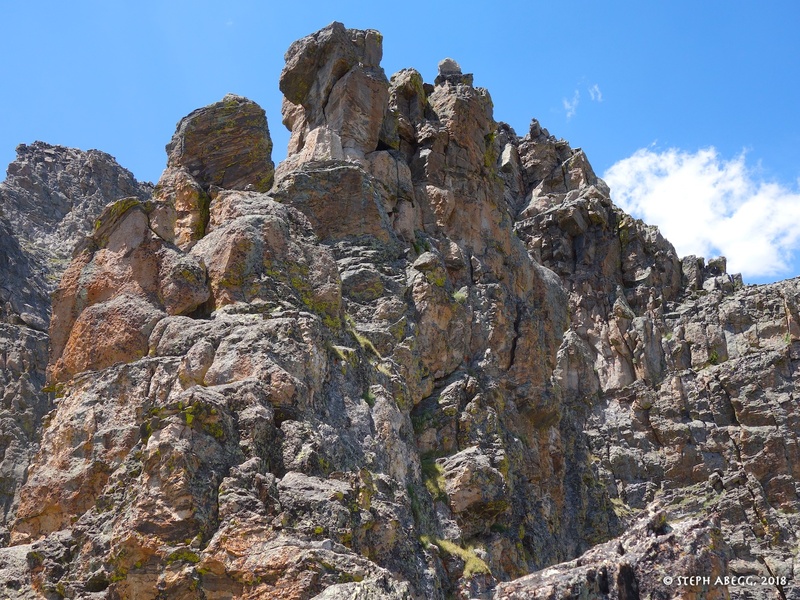 Looking towards the true summit of The Saber. 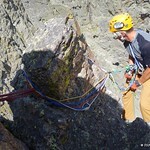 We opted not to go there, since the rappel route starts at the little summit we were standing on. 20. 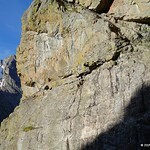 Climbers on the Petit Grepon. There must have been a dozen parties on the Petit Grepon, on a Thursday! 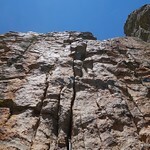 Rap 1: Off summit block. 110'. Rap 2: Off slung block. 100'. Rap 3: Off slung block. 150'. Rap 4: Off slung block. 200' to a ledge. 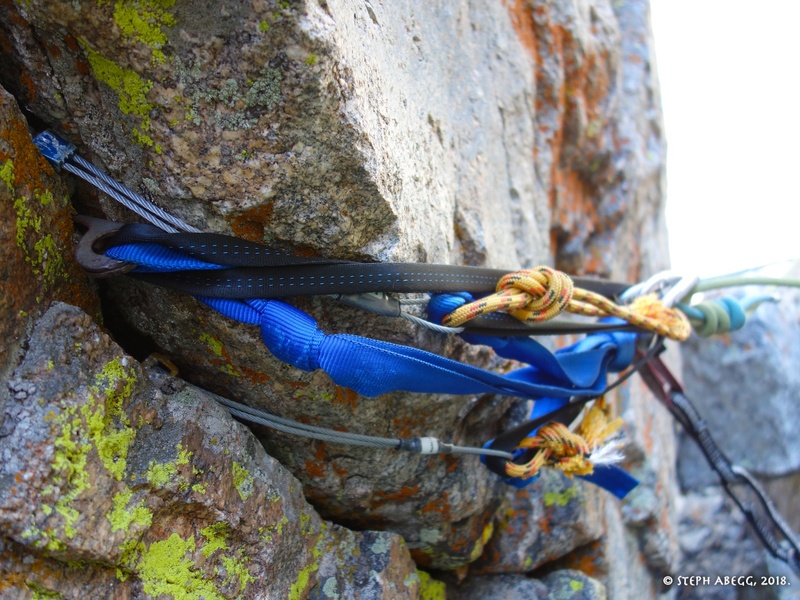 (Important: skip the intermediate rap anchor set back on the ledge with the sling to elongate it; pulling the rope from this would be very difficult and with double 60s you can reach the next ledge where there is a better anchor). 21. 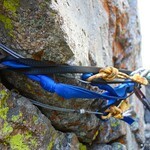 Rap Anchor #1, from the little summit where the route tops out. 25. Skip this rap station, which you pass on Rap #4. You can make it to the next ledge with double 60's. 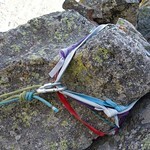 Pulling the rope from this station might be very difficult. 28. 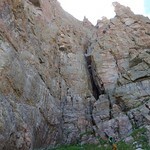 The East Face Rappel route goes down this gully. 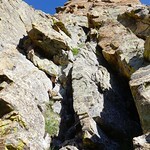 This is also the approach gully. 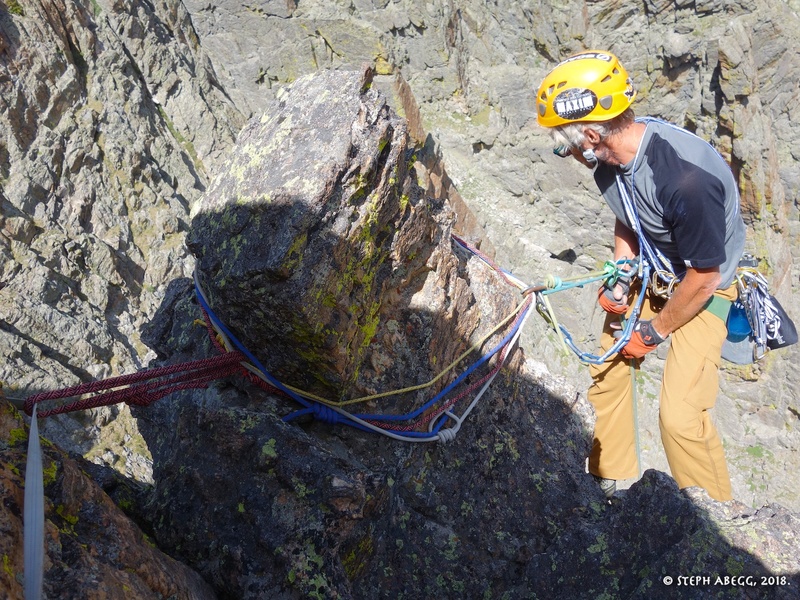 The final rappel dumps you off exactly where you started. So you can leave your approach shoes at the base! 30. 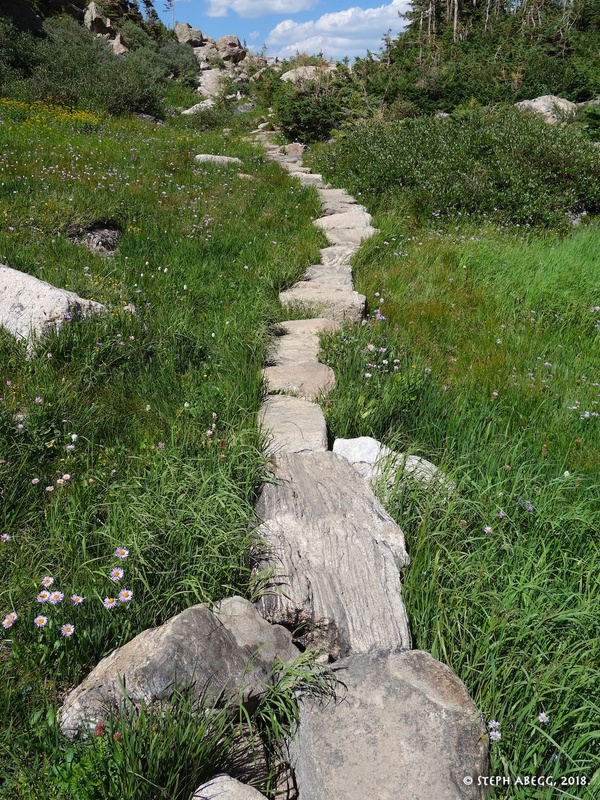 Nice stepping stones near Sky Pond. 31. 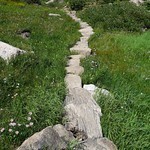 More nice stepping stones near Sky Pond. These must have taken quite a bit of effort to create. 32. 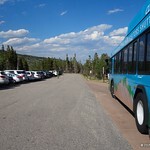 Back at the Glacier Gorge Trailhead, 12 hours after we left. 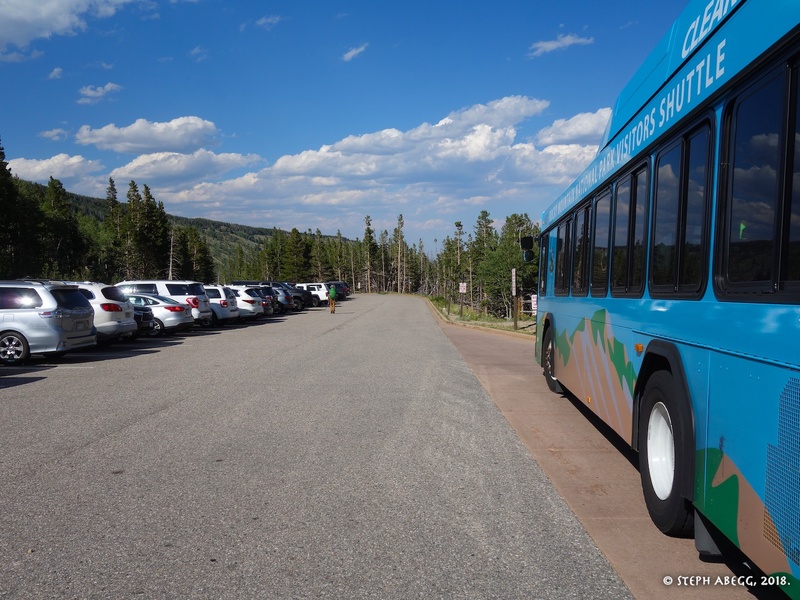 The tourists are now awake. 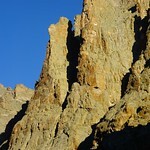 For more excellent beta, see Dow's summitpost page for SW Corner of The Saber.